Alter the angle of observance. Ten years from now or even 100 years from today, the outlook will be the same. The masses will have learned nothing, for they have learned nothing over the past 100 years and counting. They will react to the same stimuli, in the same manner, and the outcome will be the same. The game even when “Fiat money” finally meets its end will be the same. Scare the masses, force them to stampede and then come in and buy everything for next to nothing. Fear is the weapon the top shadow players use with laser-like precision, and they know exactly how to elicit a reaction from the masses. The only antidote is to alter the angle of observance, view fear as an opportunity. Only the herd gets butchered; the individual player who marches to his drumbeat can ride on the coattails of these big players. To understand trends, you need to focus on the now as opposed to looking at a future event. Future events are shaped by what is going on today and not the other way around. If you can spot what is going on right now, you will be able to spot what the future holds. The solution is always simple; the hard part is to identify the problem. We issued the target of Dow 21K in Dec 2016, well in advance of the development. After the Dow traded to 21K, it has essentially been doing practically nothing. The bulls and the bears are both trying to determine the future via fundamentals and or technical analysis and failing marvellously we might add. What is taking place is very simple; the market (up to the present at least) has and is still going through a silent correction. This correction could become more vocal towards the last stage, and we are pretty close to the last stage of this correction. 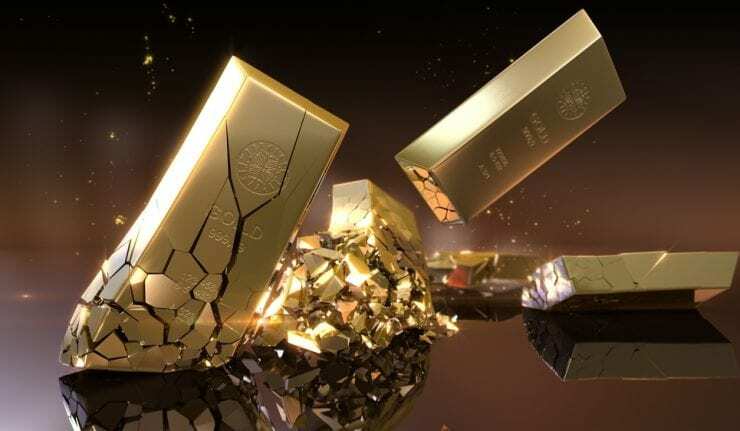 The market has been trending sideways which is one of the ways a market can let out a huge dose of steam while making it appear that it has not shed anything. The chart illustrates how the Dow is trending sideways (tight channel formation) while several technical indicators (one of which is shown in the above picture) are trading in the oversold ranges. This is what a silent correction looks like and typically the resultant move is usually up. 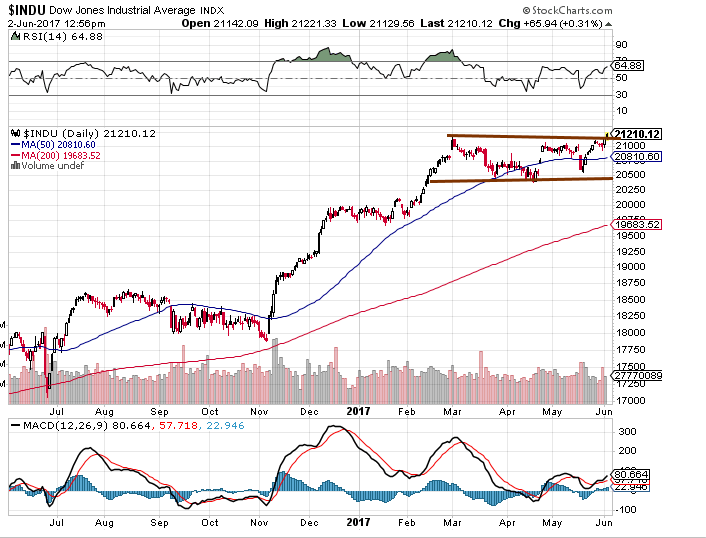 The ideal set up as we have stated many times would be for the Dow to shed 1000 points quickly over a span of a few days. The trend for the Dow and SPX is positive, so any strong pullback has to be viewed through a bullish lens. When you look at the above chart and the charts below, the crowd’s reaction to this bull market is different from almost every other bull market in history. In the last update, we confirmed that that several Dow stocks such as APPL, HD, DIS and NKE all confirmed that the Dow has the potential to run a lot higher. We also looked at over 150 random stocks, and over 60% of them were trading in the oversold ranges on the monthly charts. This market is now a stock picker’s market; in other words, you cannot just buy any stock and hope that it will trade higher because the trend is positive. A lot of stocks are going to experience crash like symptoms as the market surges to new highs. 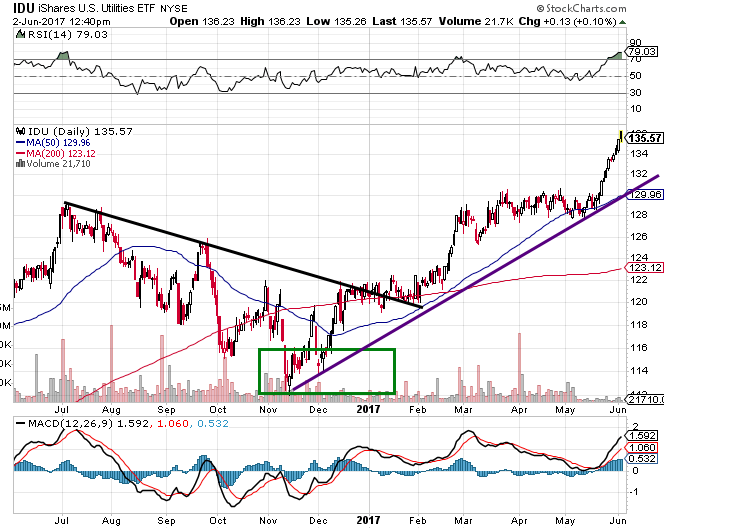 Our theory has always been that the Utilities lead the way and not the transports; that’s why several years ago we penned our first article openly stating that the Dow theory was dead. And the utilities have lived up to expectations; they predicted the market direction far more accurately than the Dow transports have over the past nine years. Mass Psychology clearly states that following the crowd is a recipe for disaster; their only function is to serve as cannon fodder. They claim to want change but the moment they are given the chance, they give into to fear and repeat the same cycle again. Watch Plato’s allegory of the cave it is a perfect example of the mass mindset in action.